Gnocchi is pronounced correctly as nyoh’-kee (the ny sound is similar to ñ in Spanish), but commonly mispronounced as nyah’-kee or noh’-kee. (You can listen to the pronunciation at howjsay.com (1)). An alternate spelling is ‘ñoqui’. Wikipedia (5) suggests the word means ‘lump’ and is derived from the Italian gnocchio (knot in wood), or nocca (knuckle). They are a cross between pasta and dumpling. 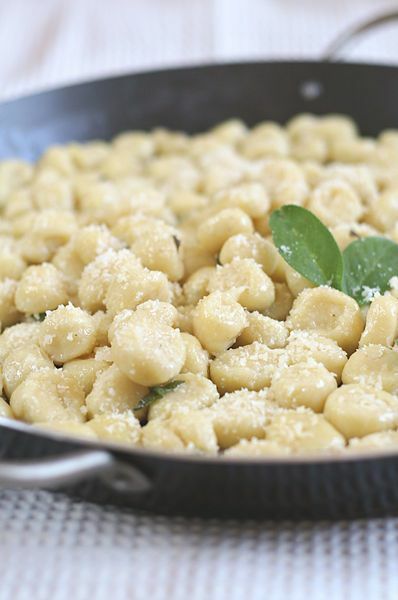 Perhaps the best known are potato gnocchi, but they can be made from a variety of ingredients, including semolina, wheat flour, or bread crumbs. Ricotta gnocchi, with or without spinach, is probably one of the original versions, from where gnocchi originated in the Middle East. The people around the Mediterranean were making gnocchi for centuries before the introduction of potatoes from the new world. Semolina or ricotta gnocchi were very common. Press, then roll each gnocchi against the tines of a fork, from the base of the tines to the tip; How-to-Make-Potato-Gnocchi video (3) shows how to use this method. If they tend to stick to the fork, dip fork in flour before forming each piece. Use the end of a fork handle, or the tip on the back side of a spoon to make a shallow indentation (lengthwise on the gnocchi), on two sides. 2. After forming the gnocchi, you can use them right away, refrigerate (covered) for later use in same day, or freeze for storage. Frozen gnocchi can be cooked without thawing first. 3. Cooking the gnocchi is done in lightly boiling water, and at the last minute, before serving. You do not want a roiling boil, because it will cause them to break apart. Just a gentle boil. They will sink to the bottom when you first add them, then float to the top when done. Remove with slotted spoon. This recipe is adapted from the May 27, 2009 Daily Inter Lake, reprinted from the Los Angeles Times (6). The author attributes his adaptation to a recipe by Lidia Basttianich. Serves 6. 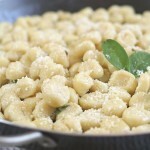 The gnocchi dough can be made several hours in advance of using; once cut, the gnocchi can be frozen and then cooked without thawing, but the gnocchi should be cooked at the last minute. Place ricotta in a fine sieve (or line a regular sieve with cheesecloth, then add ricotta), and allow to drain at least 1 hour in the refrigerator. Turn drained ricotta into large bowl; add parmigiano, parsley, salt and egg; stir until the mixture is smooth and well-combined. Add ¾ cup flour and continute stirring until it is fully incorporated. Add more flour, 1 Tbsp at a time, until mixture forms a soft sough that holds together but may feel slightly damp. This should take a total of about 1 cup flour. Remove dough from bowl and knead on lightly floured board until smooth, pliable and a little sticky. If not ready to shape, cover with waxed paper and keep in refrigerator. When ready to shape gnocchi, dough should be at room temperature. Divide into quarters. Flour your hands lightly (do not flour work surface). Working with one piece at a time, use both hands to roll the piece of dough into a rope about 1/2 – 3/4 inch thick. Cut the roll into 1-inch pieces. Repeat with the other pieces of dough. Line a jelly-roll pan with a lightly floured tea towel and transfer gnocchi to the towel. If more than one layer is needed, place a sheet of waxed paper between layers. Sprinkle each layer lightly with flour and refrigerate for at least 10 minutes. Hold a fork with its tines against the work surface, the curved part of the fork facing away from you. Starting from bottom of the tines, press each piece of dough with your index finger firmly against one piece of dough, roll it upward along the length of the tines, then let the gnocchi fall back onto the work surface. Repeat with each cut piece until all have been formed and returned to the jellyroll pan. 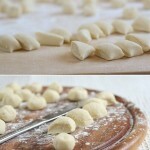 Refer to How-to-Make-Potato-Gnocchi video (3) for a demonstration. Set aside until ready to use (or freeze in a freezer bag). Rich recipe by Kyle Phillips (8, made with semolina, whole milk, egg yolks, and lots of butter. My preference would be the rich recipe, as it is more authentic, and fatty foods don’t scare me (as long as it is healthful or Good fat). See Semolina Gnoochi with Rich Tomato Sauce for an in-between version. I’ve not yet tested these recipes. I note the method is quite like making cheese puffs! Combine the milk, water and salt (lite recipe), or just milk (regular recipe) in saucepan. Bring to a boil. Add semolina in steady stream, whisking all the while. Lite recipe only: add 1 Tbsp butter, whisking. Continue stirring; mixture will thicken and you may want to switch to a wooden spoon. Continue cooking, stirring constantly until it peels away from the sides of the pot, about 20 minutes. Will be quite thick. Regular recipe only: whisk eggs with a little more milk, and stir into dough with solid butter and 1 cup grated cheese. Spread onto work surface (such as a marble slab), about 3/4″ thick, and allow to cool a couple hours. Preheat oven to 400°F. Lightly butter baking dish. Cut out rounds, using the moistened rim of a glass, or into squares. Arrange in baking dish, slightly overlapping them; you will need more than one layer. Distribute the remaining cuttings between the rounds, or save for a less elegant batch. Sprinkle grated cheese over gnocchi, and dot with remaining 1 Tbsp butter (Lite recipe), or pour melted butter over (regular recipe). Bake about 15 minutes in preheated oven, until heated through and golden brown. Serve at once, either as a single first course, or as a side dish with a roast or stew. This entry was posted in Dairy, Eggs, Flour and tagged butter, egg, flour, parmigiano, parsley, ricotta, semolina. Bookmark the permalink.